I forgot how much I love Brie cheese. Bake it with honey drizzled on top, and you have a oozy-delicious appetizer in 10 minutes. Serve with french bread and sliced green apples. 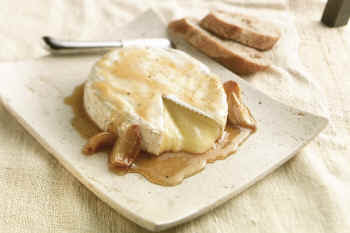 Baked Brie with Honey Place wheel of brie cheese on baking sheet, and drizzle honey on top. Lightly season with salt and pepper Bake at 300 degrees for 7 minutes (or until cheese is just starting to 'ooze'). Remove and place on large plate, with french bed and sliced green apples.